In this edition of Taste, we explore Dubai's dynamic culinary scene as part of the Dubai Food Festival. Euronews reporter James O'Hagan tucked into delicious offerings at 'Folly' restaurant where its two acclaimed chefs (Nick Alvis and Scott Price) spoke about Arab influences on their menu. He also turned up his sleeves at the 'Taste of Dubai' event with the former Michelin Guide chief (and Jumeirah’s Chief Culinary Officer) Michael Ellis. 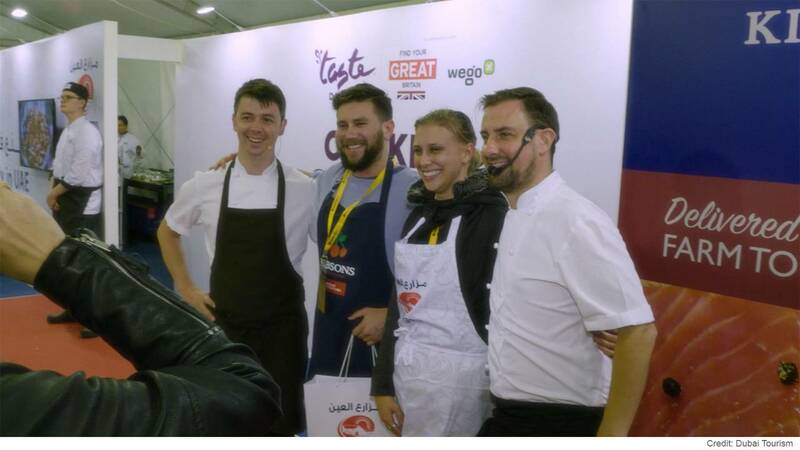 Here is the recipe for Chefs Nick Alvis and Scott Price's "Devon Crab, Basil and Seaweed". 1. Carefully pick through the crab removing any broken shell pieces. Use a stainless-steel tray with a deeper tray underneath full of ice to keep the crab meat cold as it will spoil fast if it gets warm. 2. Using two bowls, again one full of ice and the other one on top of the ice to keep the crab cold, place the meat inside and then add the other ingredients but keep a little of each back just to be sure there is not too much liquid and moisture. 3. When you’ve mixed all together, add any of the additional ingredients that are needed. Taste the mix and correct seasoning if needed. Keep chilled in the fridge. 1. Heat a deep pan with olive oil inside, when the oil starts to smoke add the crab shells being very careful of the oil spitting and splashing. 2. Roast the shells they brown, then add tomato paste and cook out for no more than 30 seconds, add the water and basil stalks then simmer for 1 hour. 3. Strain the stock, then reduce on medium heat until it’s almost like a syrup. Whisk in the crème fraîche, tear the basil leaves, add them to the pan and bring up to the boil again, infuse for 5 minutes then strain the bisque and cool. 1. Heat the oil to 120 degrees Celsius in a deep pan. Very finely slice the cabbage leaves into long thin strips and then deep fry until the bubbling stops. Remove, place on a tray with absorbent paper and season with a little salt while there is still a little oil coating the outside that it can stick to. Keep in a warm dry place until needed. 1. Pour a little basil bisque in the bowl, then using a small steel ring or cutter place a little of the dressed crab inside and gently push flat to make a level surface then take a heaped spoon of the crispy seaweed and place on top.